If making music isn’t about having fun, what’s the point in doing it? That philosophy sums up Daniel Wesley’s new album, I Am Your Man, the 33-year-old Vancouver-based singer/songwriter’s seventh studio offering. As he nears the end of his career’s first decade, what comes across most vividly on the record – as longtime fans will surely note – is the balance Wesley has found in his life both on and off stage. I Am Your Man is essentially Wesley returning to his natural strengths as a groove-based acoustic troubadour, following heavier electric experiments on his previous two records. 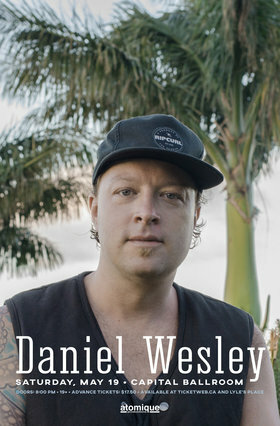 Tracks such as “Beautiful” and “Shake” perfectly recapture the slow burning west coast feel that established Wesley’s reputation when he first arrived on the scene in the mid-2000s. Conversely, the lessons he’s learned along the way, and a willingness to apply them to his music, meant there was now unlimited potential in the studio. Part of his satisfaction with the results achieved on I Am Your Man was the decision to take extra time to allow the creative process to unfold. The album’s 10 tracks equally encompass two separate sessions that took place exactly a year apart. While there are subtle distinctions between these two batches of songs, the record’s overall consistency is a tribute to Wesley’s artistic maturity. That trusted group of musicians includes Wesley’s longtime rhythm section of drummer Tim Proznick and bassist Darren Parris, along with saxophonist Alex Maher and keyboardist/guitarist Mike Kenney. Their shared chemistry is another big reason for I Am Your Man’s consistency, and why Wesley enjoyed making this album more than any other in his catalogue.